The Baileys Irish Ice is more of a dessert than a cocktail. No matter what you call it, it is absolutely delicious! This decadent "drink" makes a fun addition to St. Patrick's Day or any evening when you want to fire up the blender and enjoy your dessert in a glass. Baileys went all out with this recipe, pairing its famous Irish cream with iced coffee, a hint of mint chocolate, and Guinness-flavored gelato. 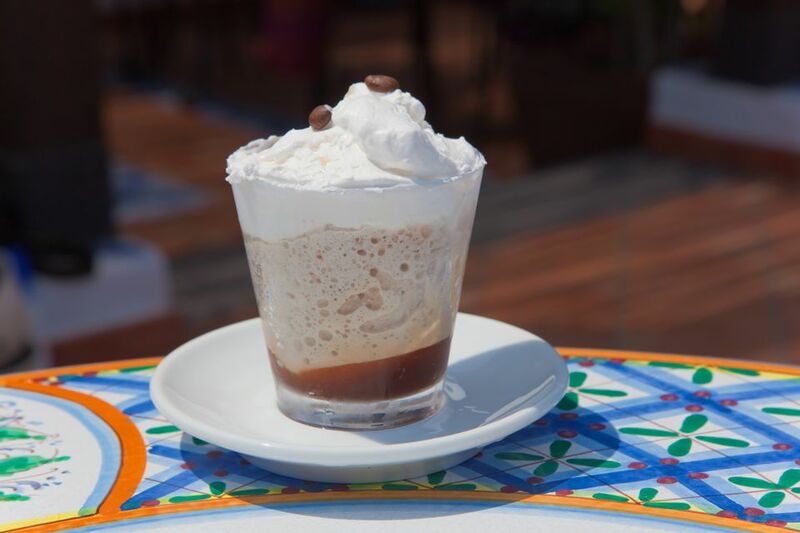 All that goes into a blender and is topped off with an espresso float, a heap of whipped cream, and fresh mint in the glass. It's a wonderful treat that is worth the effort. In a blender, add the Irish cream, chocolate syrup (if using), iced coffee, and gelato. Blend on high with chip ice until smooth. Pour into a chilled coupe, hurricane, or ice cream glass. Top with espresso, whipped cream, and a sprig of mint. The original recipe used a variation of Baileys that included "a hint of mint chocolate," which is no longer produced. Regular Baileys will do just fine. To bring back those flavors, include the mint chocolate syrup or use regular chocolate syrup and add a drop or two of mint extract to the blender. Baileys added both iced coffee and espresso to this cocktail, though they're really not necessary. If you have both, make it as directed because the espresso float does look really neat. Otherwise, simply add an extra teaspoon of iced coffee to the blender. For a really flavorful chilled coffee, try a cold brew. It's not iced coffee and the method used to make it produces a sweeter, richer flavor that's a true taste of the coffee bean, perfect for cold mixed drinks. It does, however, take at least 12 hours to brew, so plan ahead! Gelato is often described as Italian ice cream. It often has a more intense flavor and a different texture than the ice cream you may be used to. Gelato is soft and creamy because it has more sugar and less air which produces fewer ice crystals. Finding Guinness gelato is not easy, though it is a flavor that some gelato shops play around with from time to time. In most cases, you'll find it easier to make it yourself. The catch is that you need an ice cream or gelato maker. With that appliance, it's relatively easy to make your own Guinness gelato or ice cream. For a gelato, you will want to use an ice cream maker that also has a gelato setting because gelato is turned at a slower rate. Also, gelato recipes tend to skip the cream and focus on milk, so choose your base recipe accordingly. Whether you're making gelato or ice cream, getting the Guinness flavor into it is easy. For most standard ice cream recipes, you can simply add 1 to 1 1/2 cups of the stout. You might have to make a few adjustments depending on your recipe, but this formula should be a good start and the experiments are delicious. Baileys makes a variety of flavored Irish creams that would be excellent in this recipe. The brand's chocolate cherry, pumpkin spice, and salted caramel liqueurs can give it a new spin. Some of these flavors don't stay around for long, though Baileys will often replace discontinued products with new flavors. If you don't want to mess with the Guinness gelato and simply want to dive into a great frozen cocktail, try coffee or chocolate ice cream. You can also add an ounce or so of Guinness to the blender while making the drink. How Strong Is a Baileys Irish Ice? The Baileys Irish Ice will give you more of a coffee buzz than an alcohol buzz, which is why it's such a fun and tasty treat. Not accounting for the Guinness in the gelato, the alcohol content is somewhere under 3 percent ABV (6 proof). That's lighter than a beer, so there's no need to worry about getting tipsy with this drink (err, dessert).